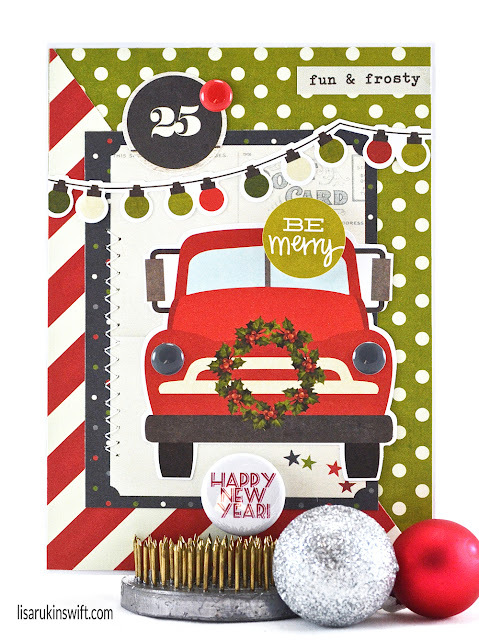 I'm going a little 50s era vintage on you today with an old red pick up truck and old fashioned Christmas lights. A piece of flair, from Feed Your Craft, adds a contemporary, festive touch. Loveeeeeeee this! LOVING that truck!!!!!!!!!!!!! So adorable, Lisa, the string of lights and truck are too fun! How adorable, love the truck! Love how you used this collection!! The car is fabulous! !